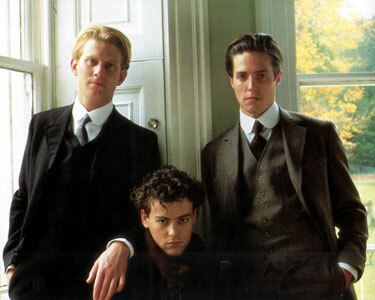 Maurice, Merchant Ivory (MIP)’s 1987 adaptation of E. M. Forster’s posthumously published novel, is playing at the BFI this week, as part of their “Out at the Pictures” Season. It is one of my favourite movies, with its profound and emotive central performances and bitter sweet ending. Seeing it on the big screen is a rare treat worth savouring. An unapologetic gay love story – one with a happy ending to boot – was not an easy proposition in the mid-1980s. Made in 1986 – immediately after the Oscar success of A Room with a View – the film is both brave and way ahead of its time; just consider the difficulty Stephen Soderbergh has faced in making Behind the Candelabra even in this (supposedly enlightened) day and age. Did you know? The screenplay was written by James Ivory and Kit Heskith-Harvey (of Kit and the Widow), but the Risley sub-plot was apparently Ruth Prawer Jhabvala’s idea. Without giving too much away, this sub-plot does a great deal to shed light on how prejudice and institutional bigotry ruin lives. I thoroughly recommend watching the film – ideally at the cinema!